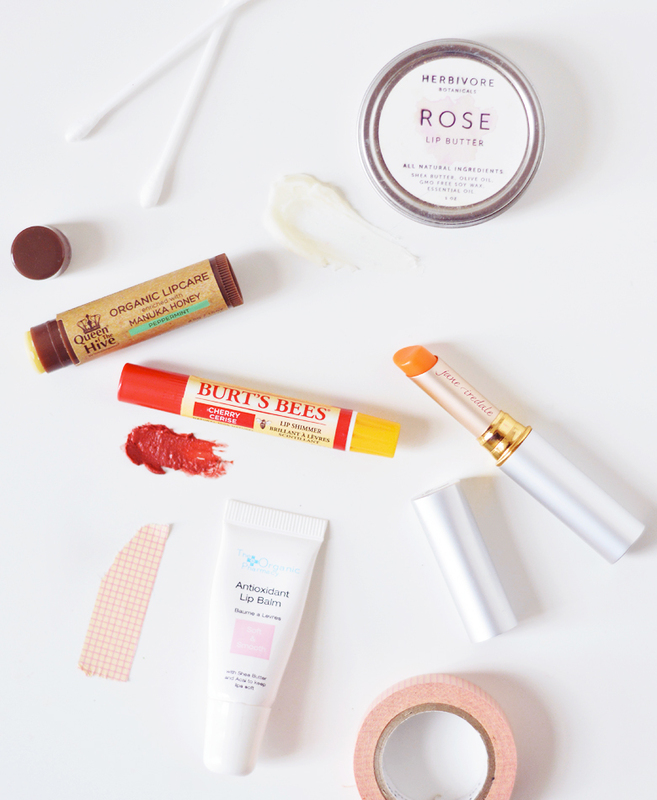 With chapped lip season well and truly upon us I thought now was as good a time as any to list my current top lip balms, which, it turns out when trying to photograph this post I don't actually own five lip balms! So it's three balms and two cheeky tinted extras that I apply equally as often as any regular lip balm because they're just as hydrating thanks to their nourishing ingredients. 1. 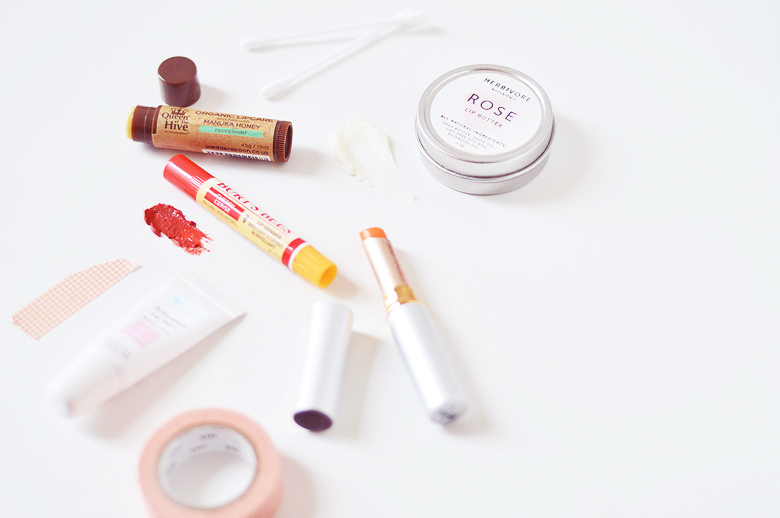 Herbivore Botanicals Rose Lip Butter (£10) The most economical long lasting balm I've used. Rich and nourishing with shea butter this is best to use at night or left for a good few minutes before applying lipstick. 2. Queen Of The Hive Peppermint Lip Balm (£3.99) This minty balm is thick and waxy with a mild peppermint tingle. It lasts a good amount of time on the lips and is the one lip balm I've been able to get my boyfriend to use without complaint, success! 3. Burts Bee's Cherry Lip Shimmer (£5.99) I love these little lip shimmers and always have the rhubarb shade in my bag. Shown above is Cherry, a pretty, sheer red shade that works great as a lip balm before a red lippy! I love the peppermint flavour and strong tingle, too, though I know some people hate that. 4. Jane Iredale Forever Peach (£18.25) This is definitely one of my favourite lip products EVER. The special PH adjusting balm creates the loveliest peachy colour (it also comes in pink and newly released red) and the formula is nourishing with avocado, olive and many more oils. 5. The Organic Pharmacy Antioxidant Lip Balm (£12) Show above is a mini size that I got free with a magazine. This balm has a chocolate orange flavour, like good old Terry's I kid you not. I'm not keen on squeezy tubes as I find the balm separates and liquid squeezes out more often than not, but I quite like this one (not just for the flavour... I swear).